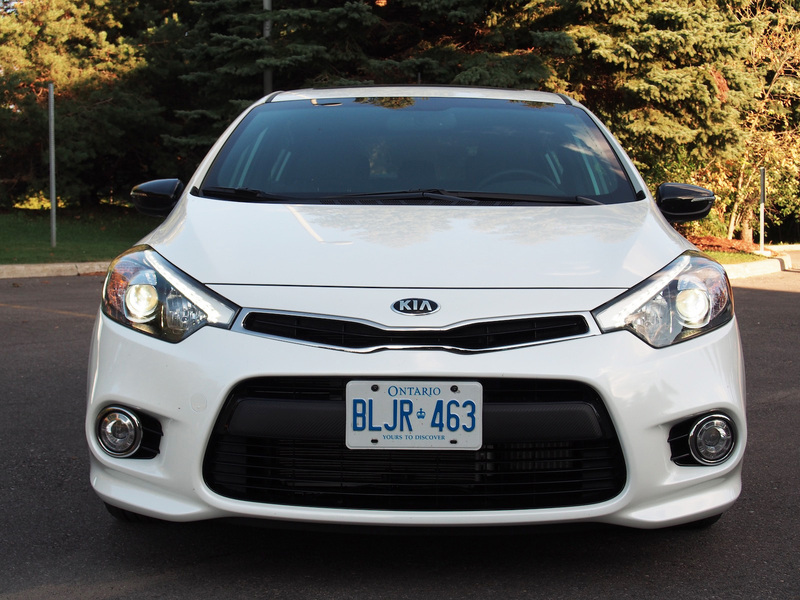 The Forte5 is Kia's sporty hatchback that takes the sophisticated lines from the Forte sedan and the sportiness of the Forte Koup. Together, the 5-door hatchback (Forte5 for 5 doors) houses a whopping 657L of cargo room with the 60/40 back seats folded up, and with the seats folded down you have just enough room to house a few bicycles and the planet Neptune. And if that wasn't enough to sell you, long behold the list of standard equipment. LED lights, heated and cooled seats, push-start ignition, this Forte5 SX Luxury model is loaded up with so many amenities and gimmicks that it makes a base BMW feel significantly unfurnished. This is the department in which Kia tries to win you over, and it's doing a marvelous job competing in this crowded sport-hatchback segment. The SX is the performance variant of the Forte5, and what sets it apart from the LX and EX versions is the juicy 1.6 litre twin-scroll turbocharged four-pot (yes you heard twin-scroll - you find this stuff in BMW engines too) that dishes out 201 hp and 195 lb-ft of torque. The Forte5 SX is not going to be faster than Ford's Fiesta ST that we tested a few weeks ago, nor is it going to trump a Volkswagen GTI in a quarter mile drag, but believe me when I say this engine knows how to throw a punch. The Forte5 is mated to a six-speed automatic transmission, though a classic manual transmission is available for the purists. The paddle shifters are a nice touch, and delivers smooth gear changes that deserve some praise. The torque is beefy at low revs, and continues to impress until 4500 rpms where it starts to dwindle. Turbo-lag is rarely present thanks to the twin-scroll technology, and there is hardly any torque steer when hammering down the throttle, a trait that is rarely found in front-wheel drive hatches. Agility is the strong suit of the Forte5 thanks to a specially tuned chassis that incorporates wider and lower profile tires, larger front brake discs, and tuned-up gear ratios. 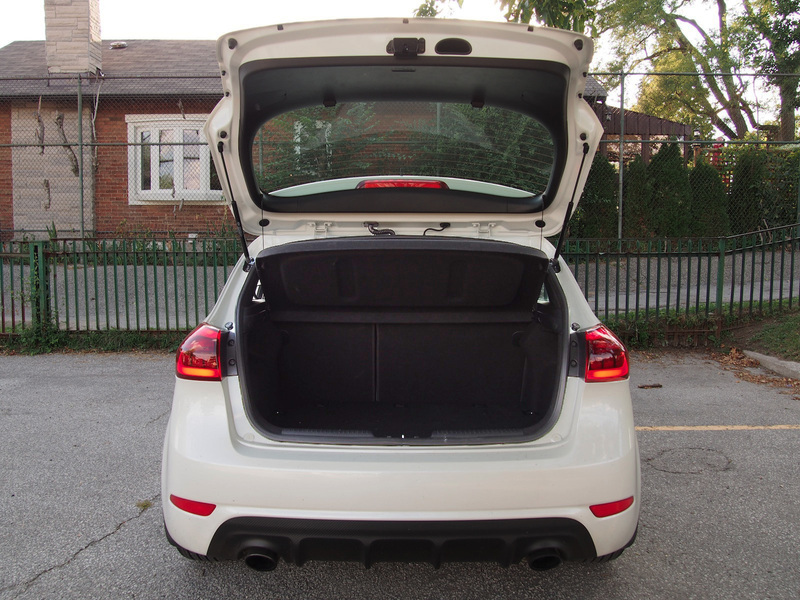 The result is a FWD hatch that grips well through corners and offers great steering precision. One thing I love about Kias is the ability to customize the weight of the steering with their FlexSteer feature, a driver-selectable steering-assist system that lets you choose from Comfort, Normal, or Sport. I would avoid Comfort mode unless you're on a long road-trip, because frankly there is no feel to the steering. Our favourite was Sport mode, where the steering gets noticeable heavier and comes with more feedback through the wheel. Fuel economy is decent. We averaged 10.3 L/100km with aggressive driving, and managed a 9.2 L/100km when coasting conservatively. 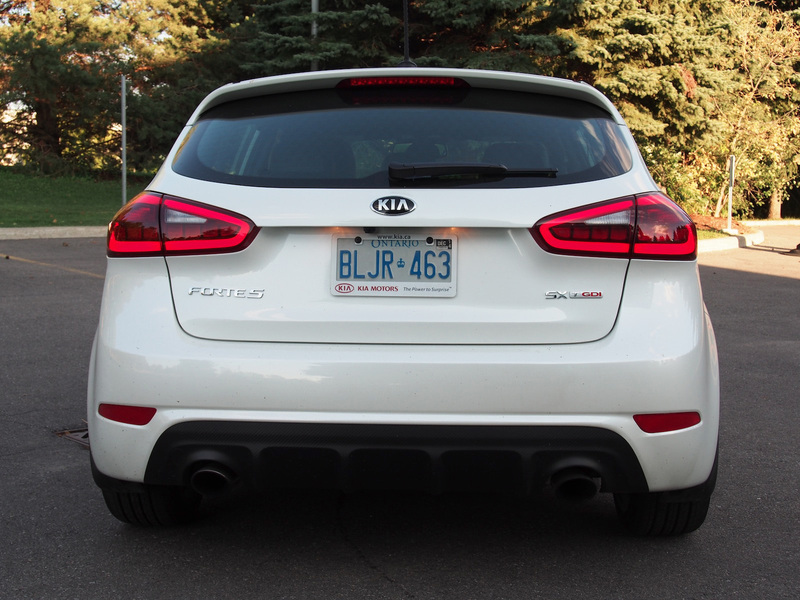 Styling is where the Kia Forte5 falls short of the competition. 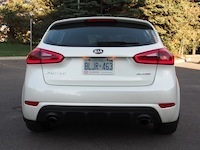 The sweeping roofline and big 18-inch wheels are characteristic of a sporty hot-hatch, but the quaint taillights and fluffy front-end doesn't make the Forte5 look aggressive enough, especially when parked next to a low-profile Fiesta ST or Subaru BRZ. Instead, the Forte5 gives off a more sophisticated look with handsome HID headlights, LED taillights, and contrasting black mirror caps and door handles. It's even got massive puddle lights that shine when you unlock the vehicle, remind you of a Range Rover? Though it's certainly not the most attractive hatch in its category, the Forte5 loads up with enough euro-style bits to keep the luster shining, except for those flowery looking wheels. I don't like those. The interior is where the Forte5 comes headstrong. When we mentioned the hefty list of standard options, we weren't kidding. The driver's seat is leather wrapped and comes with a 10-way adjustable setting, oh and it is both heated and cooled. Don't forget about the rear seats either, those are heated as well. 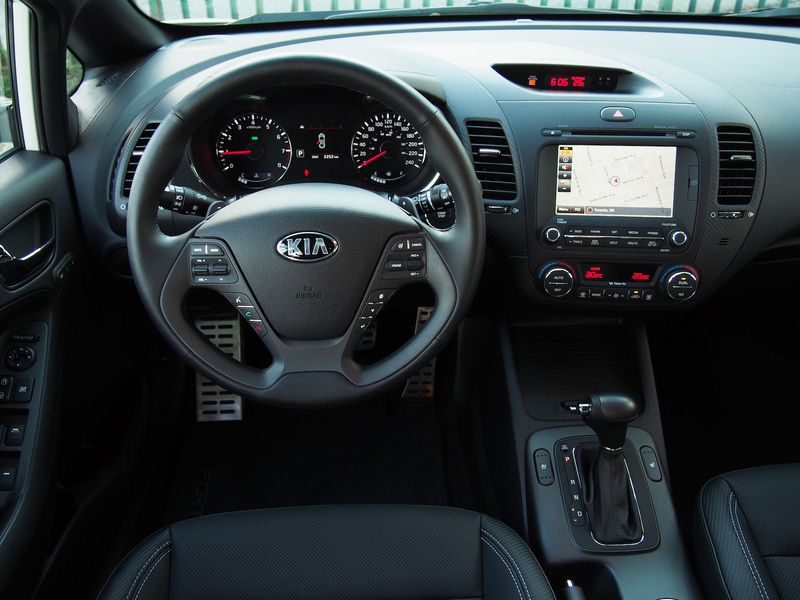 The steering wheel is also leather and heated, the sunroof is standard, as is the navigation and back-up camera. I could go on and on, but you get the point. Kia offers everything that other manufacturer's charge for, on a silver platter. The Forte5 houses one of the most enjoyable cabins in its category and certainly dominates the plain and plasticy interiors offered by Ford and Volkswagen. 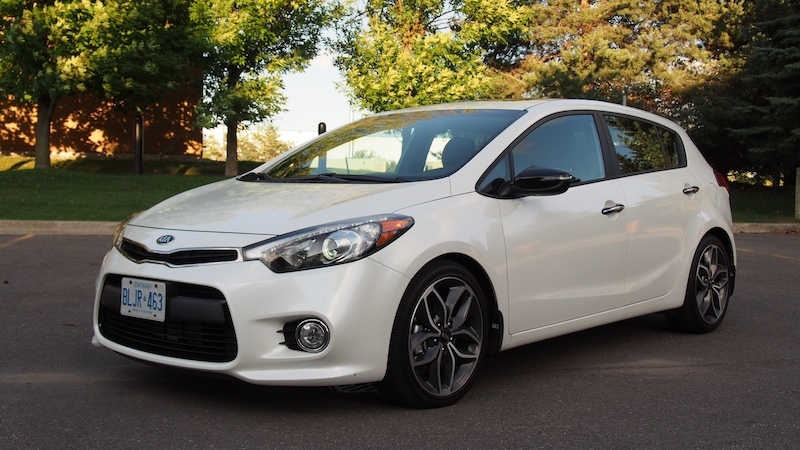 Starting at $28,795, the 2015 Kia Forte5 SX Luxury wears a similar price-tag as the Ford Fiesta ST and Volkswagen GTI. It's a worthy alternative to the current go-to hot hatches and presents with a resume littered with standard options and equipment. Would I consider the Forte5 as a "hot-hatch"? Probably not. 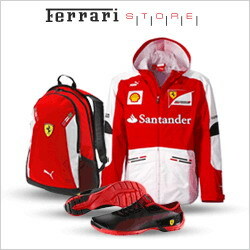 There is a whiff of sportiness, but it sacrifices most of it for added luxury and euro-style opulence. The Forte5 offers more for less, and is poised to win over the hearts of those lusting for a bargain, rather than those looking for pure performance.